The In-n-Out Burger chain started in Los Angeles, California and despite a loyal following hasn’t expanded further East than Texas. The reason for the slower expansion is because they don’t franchise their stores and they haven’t gone public. Instead they’ve focussed on food and staff quality – everything fresh, cooked to order, not frozen, no heat lamps and staff paid higher than minimum wage. 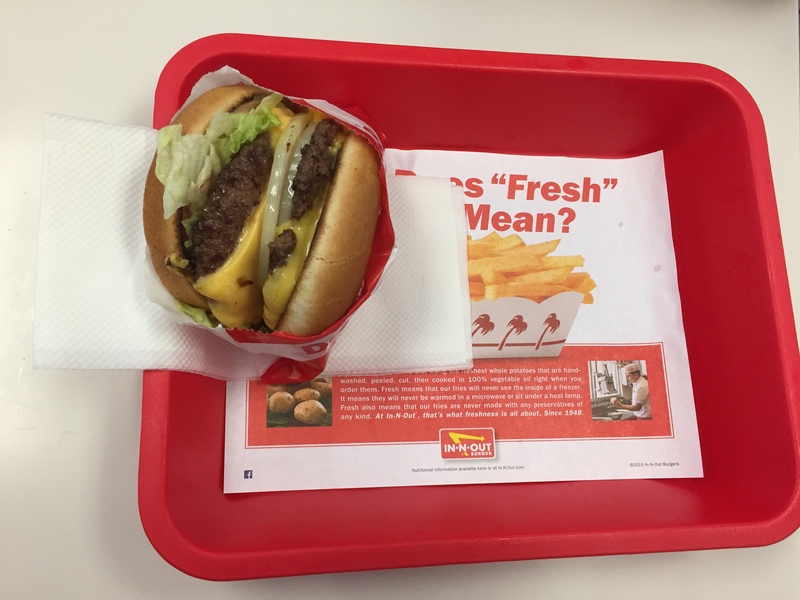 I first went to In-n-Out Burger because of the references in the excellent TV Show – Californication, where David Duchovny’s character, Hank Moody’s favourite fast food is In-n-Out Burger. The In-N-Out menu consists of three burger varieties: hamburger, cheeseburger, and ‘Double-Double’ (two hamburger patties and two slices of cheese). French fries and fountain drinks are available, as well as three flavours of milkshakes. The hamburgers come with lettuce, tomato, with or without onions (the customer is asked upon ordering, and may have them fresh or grilled), and a sauce, which is called “spread” (a Thousand Island dressing variant). There are, however, additional named items not on the menu, but available at every In-N-Out. These variations reside on the chain’s ‘secret menu,’ though the menu is accessible on the company’s web site. These variations include 3×3 (which has three patties and three slices of cheese), 4×4 (four patties and four slices of cheese), Neapolitan shakes, grilled cheese sandwich (consists of the same ingredients as the burgers except the meat, plus two slices of melted cheese), Protein style (wrap with lettuce; consists of the same ingredients as the burgers except buns), and Animal Style. 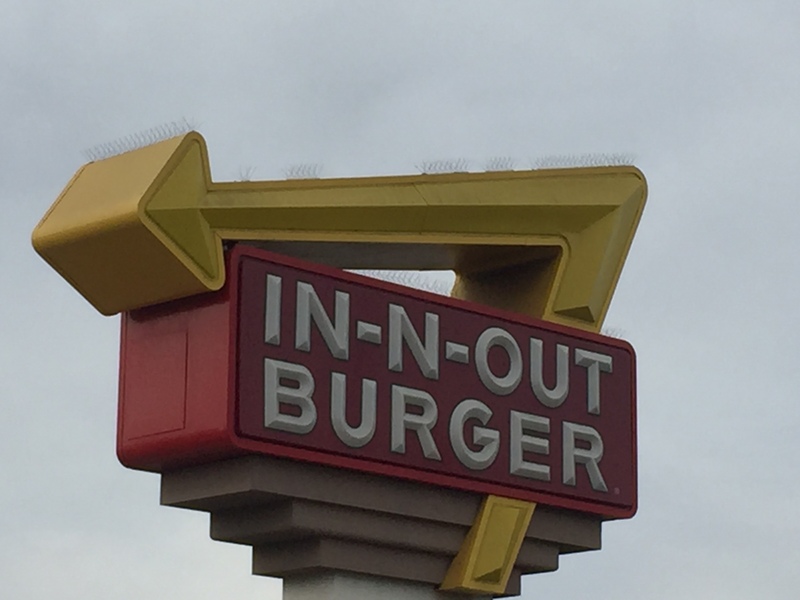 Both Protein and Animal Style are house specialties that the company has trademarked because of their association with the chain. Animal Style fries come with two slices of melted cheese, spread, and grilled onions on top. Animal style burgers are cooked in a thin layer of mustard, and in addition to the lettuce and tomato it also includes pickles, grilled onions, and extra spread. Hot peppers are also available by request. I had no idea about the ‘secret menu’ until I started writing this article. Every store that I visited was busy, with a line for both drive-thru and counter service. But service is quick and friendly and the burgers are really excellent. I actually liked the fact that there were only three choices; no vegetarian option, no filet of fish, no nuggets. I could see a guy in each store peeling and chipping potatoes. Below is a picture of my ‘Double-Double’ without fries. If you are ever close to one of their stores, I’d recommend a visit.